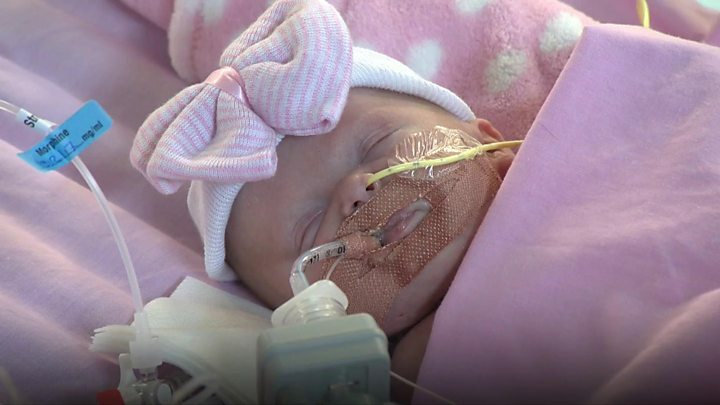 A baby born with her heart outside her body has survived after surgery at Glenfield Hospital in Leicester. Vanellope Hope Wilkins, who has no breastbone, was delivered three weeks ago by Caesarean section. She has had three operations to place her heart back in her chest. The condition, ectopia cordis, is extremely rare, with only a few cases per million births, of which most are stillborn. The hospital says it knows of no other case in the UK where the baby has survived. Her parents, Naomi Findlay, 31, and Dean Wilkins, 43, from Nottingham, say Vanellope is "a real fighter". Naomi said: "It was a real shock when the ultrasound showed that her heart was outside her chest and scary because we didn't know what would happen." The couple paid for a blood test which showed there were no chromosomal abnormalities and that made them determined to continue with the pregnancy. Dean added: "We were advised to have a termination and that the chances of survival were next to none - no-one believed she was going to make it except us." Naomi said having a termination was "not something she could do". "To see, even at nine weeks, a heartbeat - no matter where it was. It was not something I was going to take away. "In a way her strength gave me a strength to keep going," she added. Vanellope had been due on Christmas eve but was delivered by Caesarean section on 22 November in order to reduce the chances of infection and damage to the heart. There were around 50 medical staff present including obstetricians, heart surgeons, anaesthetists, neonatologists and midwives. Within 50 minutes of birth, the baby was undergoing the first of three operations to put her heart back inside the body. In the most recent surgery, Vanellope's own skin was used to cover the hole in her chest. Frances Bu'Lock, consultant paediatric cardiologist, said: "Before she was born things looked very bleak but now they are quite a lot better - Vanellope is doing really well and has proved very resilient. "In the future we may be able to put in some internal bony protection for her heart - perhaps using 3D printing or something organic that would grow with her." A handful of children in the United States have also survived this condition. Among them is Audrina Cardenas who was born in Texas in October 2012. She also had surgery to place her heart back inside her chest and was sent home after three months. Audrina was given a protective plastic shield to cover her chest. Glenfield Hospital says Vanellope still faces "a long road ahead" - the major risk being infection. The next step is to take her off a ventilator, which is being used to aid her recovery from surgery. Dean Wilkins said: "She defying everything - it's beyond a miracle." The couple named Vanellope after a character in the Disney film "Wreck-It Ralph". Naomi said: "Vanellope in the film is a real fighter and at the end turns into a princess so we thought it was fitting."